Information can be considered the most important asset of any modern organization. Securing this information involves preserving confidentially, integrity and availability, the well-known CIA triad. In addition, information security is a risk management job; the task is to manage the inherent risks of information disclosure. Current information security platforms do not deal with the different facets of information technology. 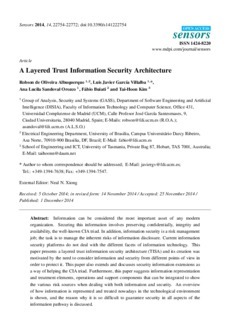 This paper presents a layered trust information security architecture (TISA) and its creation was motivated by the need to consider information and security from different points of view in order to protect it. This paper also extends and discusses security information extensions as a way of helping the CIA triad. Furthermore, this paper suggests information representation and treatment elements, operations and support components that can be integrated to show the various risk sources when dealing with both information and security. An overview of how information is represented and treated nowadays in the technological environment is shown, and the reason why it is so difficult to guarantee security in all aspects of the information pathway is discussed.